Friedman’s metaphor was all about printing and distributing physical banknotes. In practice, a modern helicopter drop would be a joint operation between a government and a central bank. First, the government would carry out a bond-financed tax cut or spending programme to transfer resources to firms and households. The central bank would then simultaneously buy the equivalent amount of government debt in the secondary market in exchange for reserves; in a manner that would be observationally similar to the quantitative easing (QE) programmes that some central banks have conducted to date. The key distinction between a helicopter drop and QE is that the former is permanent, while the latter is expected to be – and eventually is – unwound. Such an operation possesses many of the hallmarks of pure fiscal policy. But helicopter money is different from conventional fiscal policy because the economic boost has seemingly appeared from nowhere: it is funded by newly created money. If the government simply issued debt to finance a tax cut, forward looking households might worry that their taxes would eventually increase and respond by saving some of the windfall today. This is the principle of Ricardian Equivalence. In Friedman’s thought experiment, however, the central bank issues zero-coupon perpetual debt (banknotes). With no future tax obligation, firms and households might have an incentive to go out and spend more of their money. In this article I explore the extra ‘kick’ one might get from helicopter money over and above conventional fiscal policy. When does helicopter money work in principle? Some people have tried to pin down the necessary conditions for helicopter money to provide that extra kick in modern economic models. Buiter identified three conditions in a recent paper. First, money has value. This rather mysterious condition guards against a quirk in models where no one uses money for anything; people instead choose to barter. Second, people want to use the money they receive to buy goods and services rather than save it – the government should not provide everyone with a term deposit at an attractive interest rate. Finally, the monetary injection has to been to be seen to be irredeemable – the newly created money is considered to be an asset (examples here) for households and firms but not a liability for the central bank or government. The central bank can accomplish this by destroying the newly purchased government debt or credibly committing to roll it over indefinitely. While this irreversibility is fundamental to the success of helicopter money, it is difficult to achieve in practice as it requires tying the hands of future governments. Why is helicopter money different to QE? Unlike helicopter money, QE is reversible by its very nature. A central bank can respond to improving economic conditions by selling the purchased securities in the open market. Even without active sales, the government securities will eventually mature and automatically destroy the associated reserves. One way to visualise the difference between QE and helicopter money is through the central bank’s balance sheet. For some macroeconomic questions, it is useful to consider the consolidated public sector. But it is sometimes useful to think about the central bank as a separate entity, with its own balance sheet, even if it is a wholly-owned subsidiary of the government (Figure 1). Its assets tend to be government securities and loans to the banking system (usually so-called reverse repurchase agreements). On average, a central bank’s assets are likely to yield a return similar to that of the prevailing overnight official interest rate – Bank Rate in the United Kingdom. Central banks have three major types of liability: they issue banknotes; they hold commercial banks’ deposits (called reserves); and there is a balancing claim on the assets (central bank capital). 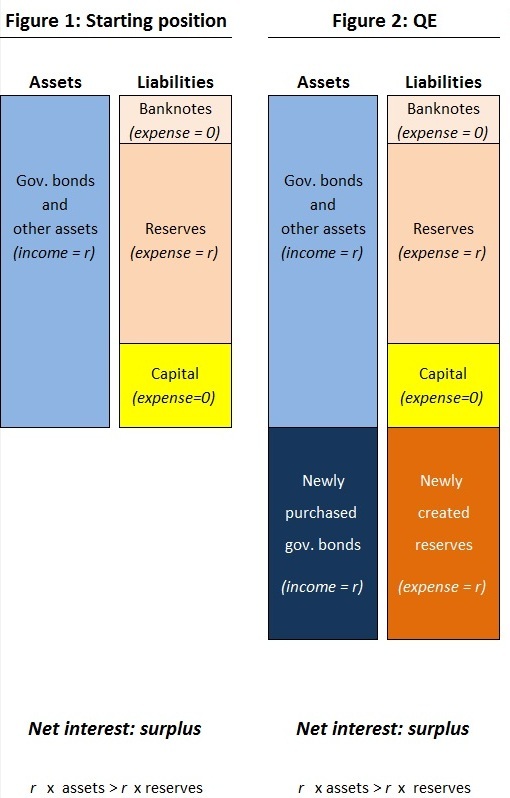 Of these, only the reserves are remunerated, at the overnight interest rate, r in the diagrams below. Most of the time a central bank has a positive net interest income, and this is usually transferred back to the government. QE involves buying government securities by creating reserves. The balance sheet expands. The newly purchased securities pay an income stream that broadly offsets interest payments on the additional reserves. For simplicity, let’s assume that securities and reserves both pay the overnight interest rate so the net interest income is zero. Importantly, because banknotes and capital pay no interest, the total income of the central bank’s assets less liabilities is likely to be positive in the medium run (Figure 2). What’s different with helicopter money? The easiest way to make the monetary stimulus permanent is to cancel the newly purchased government securities (Figure 3). The central bank’s liabilities are now greater than its assets. In some senses the central bank is now ‘insolvent’. Ordinarily, a government could recapitalise the central bank by gifting it government securities. But this requires issuing new debt, all else equal, which reduces the initial stimulus to a vanilla, bond-financed fiscal transfer. For people to believe the stimulus is actually irreversible, people need to believe this recapitalisation will never happen. While insolvent, if the central bank continues to pay interest on all reserves, its asset income could fall short of the interest owed on its liabilities, leaving it with a financial deficit. Unlike a normal company, a central bank can simply create reserves to pay for the shortfall. 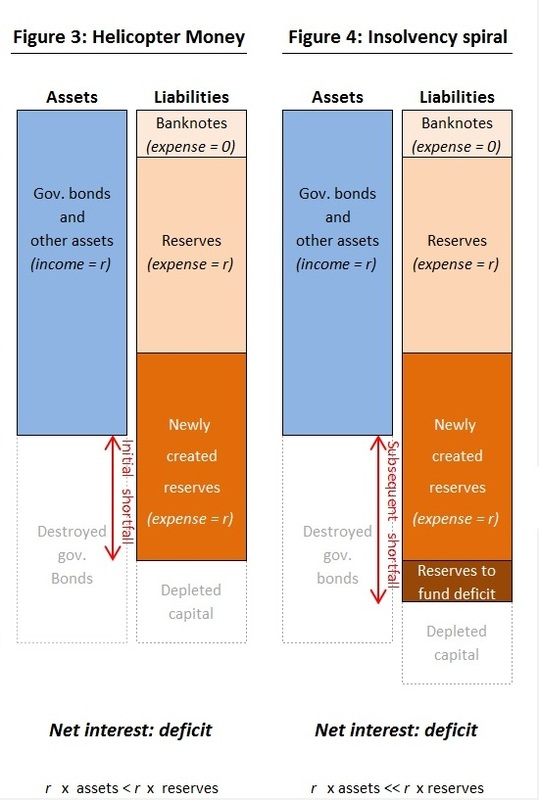 But creating new reserves to fund the deficit only provides short term relief and it eventually leads to the size of its balance sheet – and the quantity of money in the economy – spiralling out of control (Figure 4). This phenomenon is sometimes referred to as policy insolvency because a central bank will struggle to meet an inflation target in such a situation. An alternative to losing control of the size of its balance sheet is for the central bank to refrain from paying interest on the additional reserves. With an excess of reserves in the system, however, this is tantamount to committing to keep the marginal, policy-relevant interest rate at zero for a long period of time (technically, until the demand for physical notes expands to meet the additional monetary stimulus). The difference between these two alternatives matters for the evolution of the central bank’s balance sheet but the implications for monetary stability are the same: the central bank has lost the ability to act against future inflation. A successful helicopter money injection is difficult to achieve in principle because it requires people to believe that the government and central bank want to relinquish control of future inflation. That probably requires designing commitment mechanisms that actually jeopardise future price stability for the sake of the near-term stimulus. The extra kick from helicopter money, over and above standard fiscal policy, relies on credible promises to threaten the welfare of future generations. At the same time, designing truly irreversible policies tends to be exceptionally hard and if the commitments are not credible there is unlikely to be any additional stimulus. In practice, a helicopter drop would require the central bank to commit to keeping its interest rate close to zero for a long time or lose control of its balance sheet, which stands in stark contrast to current policies involving QE. For a country like the United Kingdom, this would be inconsistent with the MPC’s primary remit of medium-term price stability because the Committee could not react to future inflationary pressures. Meanwhile, there are good reasons not to blur the institutional demarcation lines between fiscal and monetary policy. For helicopter money to work, households and firms have to believe that all future central bankers and governments want to abandon inflation targeting. That seems implausible given current institutional set-ups. Convincing people of the policy’s irreversibility will therefore require threatening to impose large costs on society at a future date. While fiscal policy may stimulate growth, the extra kick from helicopter money is either non-existent or comes with a sky-high price tag. Let’s leave it to the eschatologists. Previous Post UK mortgage rates: born in the USA?